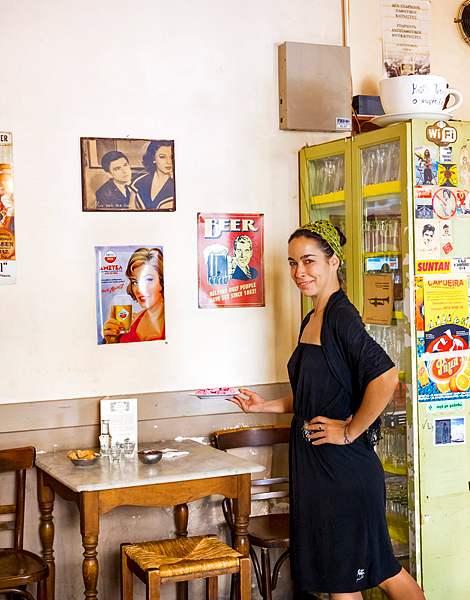 A traditional café since 1938 and the home of a street theater company, it returned to the neighborhood in 2008. It embraces a philosophy stipulating that “the cafe is a parliament and a doctor’s office.” In the summer, the tables on the sidewalk attract new patrons in droves. There are generous servings of meze at good prices and rebetiko every Tuesday. INFO | 88 Kerameikou and Plateon • Tel. (+30) 210.342.5166 • Open from 08;00 for coffee • Cost: up to €10 per person. Ideal for groups, hours of conversations flow in the tidy courtyard strewn with gravel. From spring to October, it’s packed. Nice details in the decoration, clean toilets. Be prepared for crowds in the winter. INFO | 110 Kerameikou • Tel. (+30) 215.550.6414 • Open from 13.00 • The kitchen is open from 14.30 to midnight • Cost: €1.50 espresso, simple drinks start at €5. In the summer sit on the terrace of Bios, with a view of the Acropolis, while in the winter, enjoy the Soviet atmosphere of Tesla. Sit back on the train seats or Berlin-style chairs and lose yourself at the car lights snaking their way to Piraeus. A large bar and good music. From the cocktail menu, try the Sevda Kafir with rakomelo, grenadine and lime. INFO | 84 Pireos • Tel. (+30) 210.342.5335 • Open: 11.00-02.00 • Drinks and cocktails from €5. 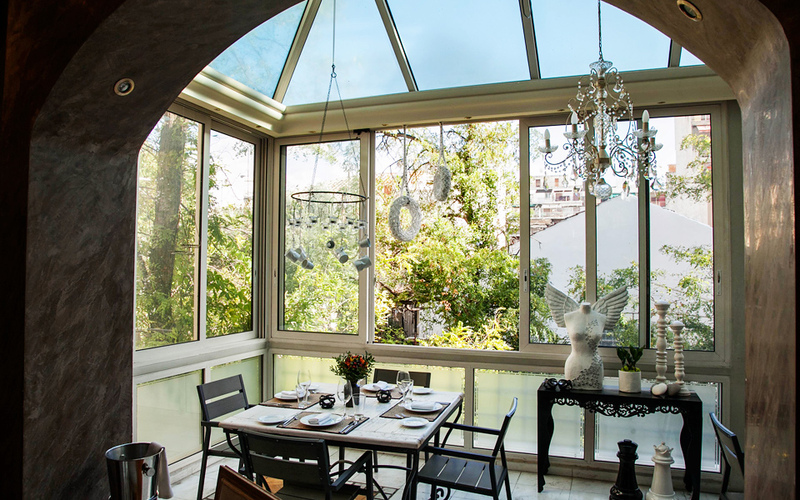 A high ceiling with skylights, climbing ivy, pots and a large terrace with wrought iron furniture. In the morning, they serve good quality coffee, two types of pie and snacks. There is a small all-day menu with burgers, quesadillas and bruschetta, while the drinks selection includes 17 types of gin and 21 types of rum. Between 14.00 and 20.00, they serve light drinks with low alcohol content. INFO | 31 Leonidou • Tel. (+30) 211.012.1099 • Open: 10.00-02.00 • Fri-Sat until 03.00 • Espresso €2, drinks from €6.50. An impressive, full-concept sandwich bar. It is self-service, you order inside, sit in the small living room in the back – which is a little reminiscent of Berlin – or outside at the few sidewalk tables. Their bread comes from the Rizos bakery in Koukaki. Any one of the recommended sandwiches is bound to grab your interest. Of course, you can also invent your own. All meats are from Sary while the organic eggs and the sauces are made on the premises. They have many vegetarian options. Try the Noe Valley with roasted cauliflower and Cappadocia salad, or the vegetarian Lake Sad with avocado, grilled cheese and honey and mustard sauce. There are about 20 labels of Greek beer on offer. Your sandwich is ready when you hear the bell ring and it is served in a plastic bread basket along with candies. Try the chocolate they make. INFO | 99 Kerameikou • Tel. (+30) 215.551.2845 • Open: 12.00-00.30 • Cost: from €3.50. What does the Silence of the Lambs taste like? Can you eat a burger in one bite? Here, food is a game and nothing is what you expect. Foam, air, geometric shapes, illuminated dishes and impeccable styling. Prepare to be amazed. This place has gained two Michelin stars. Its two imaginative young chefs, Georgianna Hiliadakis and Nikos Roussos lead the kitchen with a brigade of young cooks, confectioners, sommeliers, waiters and managers. There are two degustation menus, small and large, containing around 16 dishes. A thorough wine list offers 165 selections, predominantly from the international vineyard, and 32 others which are available by the glass. Reservations should be made up to one month in advance. INFO | 13 Paramythias • Tel. (+30) 210.524.2727 • Open: Tue-Sat 19.30-22.30 • Cost: Two options for the degustation menu, €150 per person or €240 per person with wine for the larger menu, and €120 per person or €200 with wine for the smaller menu. It’s as if someone had been quietly working away at the restaurant in this neoclassical building until success finally knocked on the door, both for the chef Gikas Xenakis and for the persistent owner of the restaurant, Nikiforos Kechagiadaki. Aleria is now the home of modern Greek cuisine and is based on the triptych of good ingredients, high technology and modern ideas. You can select the food based on the wine you like – the wine list is long and the staff is knowledgeable. Try the beef tartare with yogurt, wasabi cream and ouzo jelly. The Mytilene mackerel with black garlic cream, fresh grapes, fennel and rosemary vinaigrette is also delicious and the courtyard is wonderful. INFO | 57 M. Alexandrou • Tel. (+30) 210.522.2633 • Open: Mon-Sat 20.00 to 00.00 • Cost: around €30 – 40 per person without wine. The home of the chef Alexandros Kardasi. The salon for the winter has 50 seats, while the outer space accommodates twice as many. 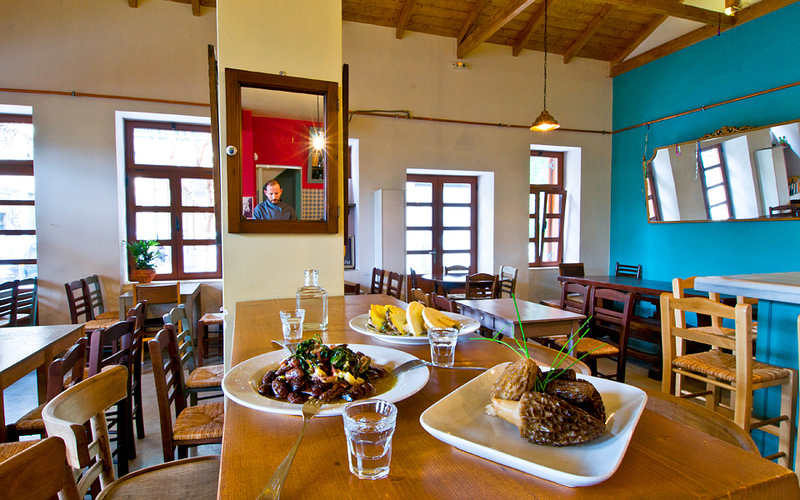 The food is modern Greek cuisine with a traditional base. The menu changes twice a month. It’s small, with about 12 appetizers and salads and seven mains. They make their own bread daily and their food has a nice Greek character. The wine list features 18 white and 18 red, all local. Every Sunday, a small heated playroom operates for little guests. INFO | 15 Plateon • Tel. (+30) 210.346.2983 • Open: Tue-Sat 20.00-01.00, Sunday afternoon 13.00-18.00, closed on Mondays • Cost: About €25 per person without wine. Seychelles, a new-age tavern with old-style kafeneio chairs crammed around the tables. A new-age tavern with old-style kafeneio chairs crammed around the tables. The dishes are made with carefully selected Greek ingredients from renowned manufacturers and good quality cheeses, such as krasomanoura from Kimolos, galomyzithra and aeromanoura from Vlasti – some of which can be purchased for the home. Tasty lentils and rice, smoked tuna from the fisherwomen’s cooperative in Kalymnos, and octopus in wine sauce with pea puree. Consistency of quality is an issue from time to time. Several options for spirits and barrel wines, as well as a few bottled labels. INFO | 49 Kerameikos • Tel. (+30) 211.183.4789 • Open: 14.00 to 01.00 and until midnight on Sunday • Cost: €18-20 per person. Whoever is in the kitchen likes to have fun, and certainly enjoys cooking. The place serves Mediterranean cuisine, dishes with exotic touches, innovative comfort food and nice soups, all at reasonable prices. Sometimes you’re not sure what it is you’re eating. Space is limited and when the restaurant fills up, service slows down. The beers are from Greek breweries. INFO | 10 Plateon • Tel. (+30) 211.710.8877 • Open: Tue-Thu 16.00-00.30, Fri-Sat 13.00-01.00, Sunday 13.00- 20.00 • Cost: About €18 per person. 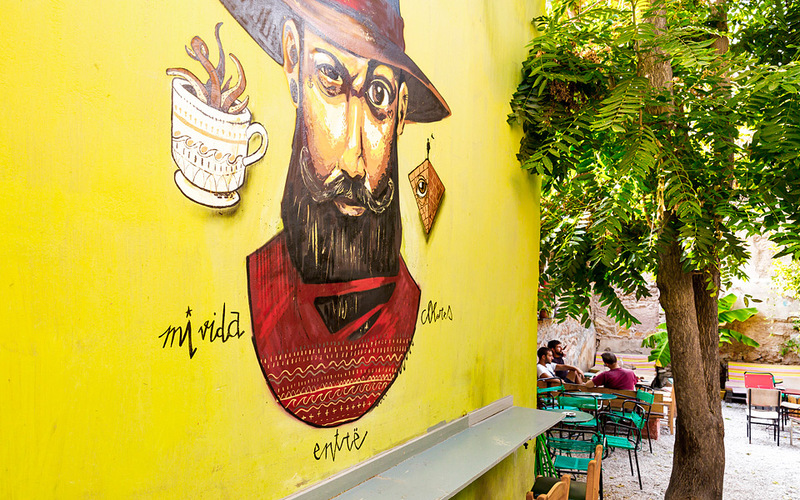 A Middle Eastern café/restaurant where fringes hang from the ceiling, paintings decorate the walls, and there are red sofas to sit on and enjoy hookahs which come in apple, jasmine, rose, watermelon, mango and melon flavors. It has changed many hands – the previous owners were Syrians, Egyptians and currently Iraqi– but it has steadily served original appetizers. Falafel, beans with eggs and tomatoes, koupepia, tahini salad, baba ganoush and lemony tabbouleh. INFO | 85 M. Alexandros • Open: 09.30-03.00 • Cost: €8-10 per person • Hookahs cost between €1.5 and €3. Greek and Mediterranean cuisine follows the beaten track of ingredients and recipes with interesting variations. Very friendly service. Clean, simple food, like the Kasian pilaf with chicken, braised rice, beef with an Asian-inspired sauce, and beef tenderloin with mavrodaphne. For drinks, there is beer. UPDATE: Sixtie’s Dinner has now been replaced by Beba. The chef in charge of the kitchen remains the same however the menu, which is still being developed, will likely have a greater emphasis on classic Mediterranean dishes. INFO | 102 M. Alexandros • Tel. (+30) 210.577.7355 • Open: 14.00-24.00, except Tuesday • Cost: €17-22 per person. Ambassadors and official guests arriving from China in Athens eat here. It’s a high-end Chinese restaurant with two golden lions at the entrance. As you enter, there are tanks containing crabs and shellfish that will be prepared into dishes. A large salon divided into two rooms, adorned with a peacock mural. A menu offers the usual fare, but if you’re Asian, you’re informed verbally about specific dishes and delicacies unknown to Westerners. Their specialties are the tofu with chili and squid with peppers. Soups, appetizers, ducks and a variety of Cantonese flavors appear numbered on the list. There is fried banana and fried ice cream to finish. A few Greek wines, sake and Chinese beer. INFO | C116 Kerameikou and 26 Iera Odos • Tel (+30) 210.341.0828 • Open: 12.00-01.00 • On Fri- Sun there is an all you can eat buffet at €14.50 per person (€7.50 for children). Cost: About €25 per person. Perhaps the first modern Thai restaurant in the city, it has a nice atmosphere, like entering a summer party. The food is not purely traditional (the flavors are refined), but the ingredients and the manufacturing process is authentic. They make their own sauces, and the owner, Angela Skourli, assures us that they don’t cook with a lot of sugar and flavor enhancers. Try the mee grop salad with crispy noodles, bean sprouts, carrot, pineapple, dried shrimp –it may sound simple, but it’s worth it and in the Thai provinces, it’s considered a festive meal. Definitely try one of the soups. For drinks, there are 10 cocktails, Greek wines, Asian beers and sake. Good service. INFO | 51 Kerameikou • Tel. (+30) 210.522.5945 • Open Tue-Sat from 19.30 to 23.30 • Cost: €25 per person. This place has the monopoly on souvlaki in the area. Pork and chicken grilled on skewers. They also have pancetta and kebabs. The individual servings of meat are highly recommended. Nice and honest portions. 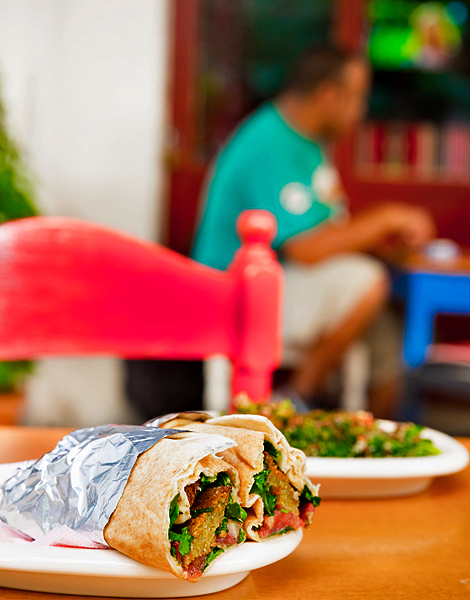 The accompanying pita comes in varieties of rye, corn and wheat. Delivers to Gazi, Votanikos, Kolonos, Sepolia, Thiseio and Petralona until 01.00. INFO | 29 Plateon and Leonidou • Tel. (+30) 210.345.5836 • Open: Sun-Thurs 12.00-03.00, Fri- Sat 12.00-05.00 • Cost: €1.50 per souvlaki with bread and potatoes. A brand new patisserie which opens in the morning for Greek coffee with loukoumaki delights, fragrant teas, traditional and European sweets, galaktoboureko (custard and semolina pie) and waffle, fruit salads and ice cream. In the evening they serve rakomelo. Sells essentials and anything you might have forgotten to buy at the supermarket.It boats a good selection of groceries that is much appreciated by the entire neighborhood since there are no other fruit vendors nearby. You will find pulses sold by weight, Arabic bread and fresh dates. The owner is extremely polite. You’ll come here not only for a fine selection of weekly necessities, but also for the information. Stefanos and his brother Loukas are well versed in the latest trends, and know everything about super foods, and what’s good for babies, wrinkles, and stomachache. They are the kind of grocers you want to have in your neighborhood because you trust them. Traditional Greek food items, organic products and imported goods, a small but complete green grocer, cosmetics and many essential oils, herbs, organic meat to order, organic chicken, cheese, macrobiotic vinegar, fresh bread from Mama Psomi in Koukaki, and organic aloe juice from Chios. The imported products are a little expensive. There is an online store with more than 8,000 products, which are dispatched across Greece from Athens. (http://www.bathoskipos.gr). INFO | 99 Kerameikou • Tel. (+30) 213.023.5776 • Open: 09.00- 22.30, Sat. 10.00- 21.00. 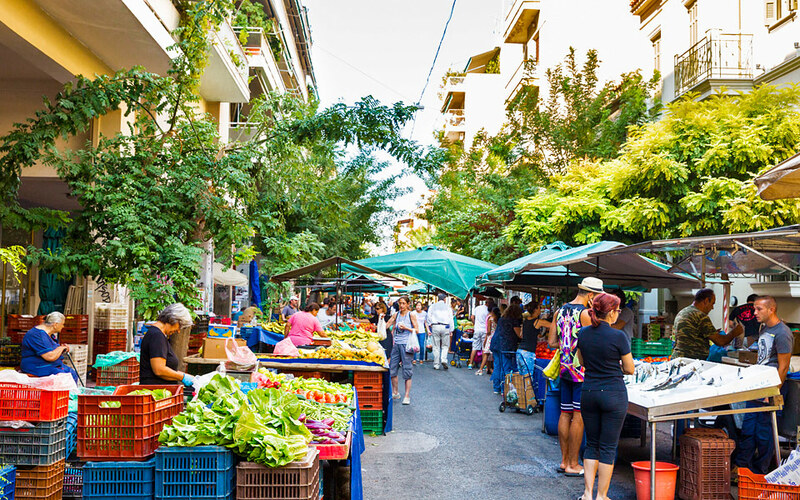 This market is set up on Kerameikos road from Plateon to Thermopylon streets. 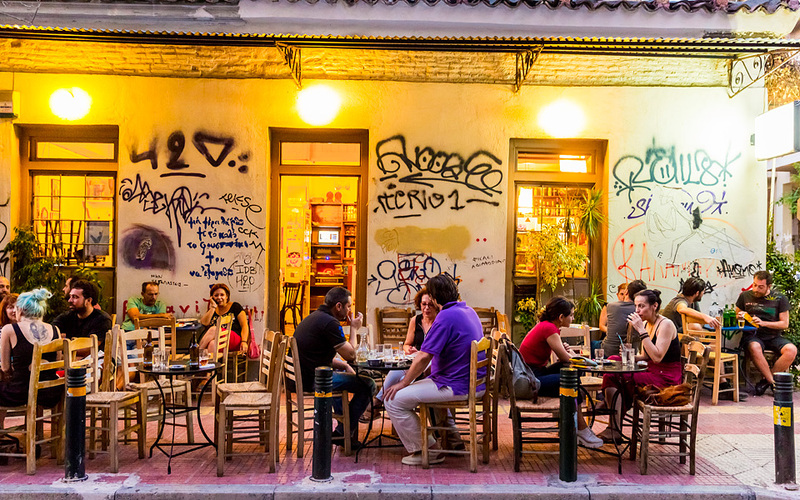 It is one of the smallest markets in Athens. Seasonal and non seasonable vegetables are sold here, mostly by traders with some producers in between. Eggs, some fish and legumes are on sale too. The stall of Ioannis Bethany sells greens and seasonal herbs, both wild and cultivated, while Nicholas Kotzia from Zevgolatio in Corinth sells raisins, sultanas, juicy strawberries and sweet, round grapes. On Monday, Wednesday and Saturday at the corner of Agisilaou and Myllerou, the Asian residents of the area hold their own flea market. Spread out on the pavement, you’ll find geese and ducks through to coriander with its root (which is ideal for homemade curry).There are, however, two problems: a) they don’t sell to everyone – if they like you, they’ll consider you a customer. b) there are no refrigerators for poultry, and everything is completely exposed. Shop with care.